Alvar Aalto was born in Finland and studied architecture at the Helsinki University of Technology, graduating in 1921. An early champion of Nordic Modernism, by the mid 1930’s his reputation spread beyond Scandinavia to international acclaim. Alongside his architectural endeavours Aalto also designed furniture, textiles, and glassware; many of his designs are still in production and have achieved iconic status. Many other Modernist architects and designers, including Marcel Breuer and Erich Mendelsohn used Aalto’s furniture in their buildings in the UK. The green ‘Armchair 403’ designed in 1931 for the Paimio Sanitorium was adopted for the original restaurant of Erich Mendelsohn and Serge Chermayeff’s De La Warr Pavilion at Bexhill on Sea, the ‘Stool 60’, designed in 1933, is one of the most recognisable pieces of Modernist design still in use all over the world. The contemporary versions shown here are produced under licence by Artek. Alvar Aalto’s ‘Savoy Vase’ was designed in 1936 for the new Savoy Restaurant which opened in Helsinki in 1937 and like much of Aalto’s work has become an international design classic. 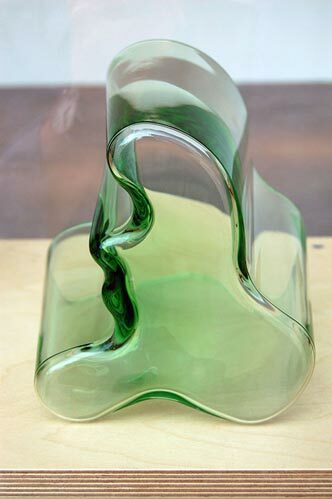 The original prototypes, based on an Eskimo dress, were made by blowing molten glass into a mold of sticks which swelled to create a wavy line. The originals were made in the glass factory at Iittala in Finland where they are still handblown into wooden molds today. 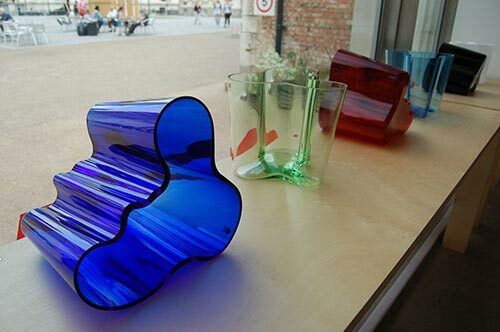 As such, each vase is unique. Modern and Contemporary Finnish design can be obtained from Skandium.com who generously supported this exhibition.